Whether you want to launch your new release with a bang or put some life into an older publication, virtual book tours can be an effective marketing strategy. They can be done from the comfort of your own home and at little or no cost. 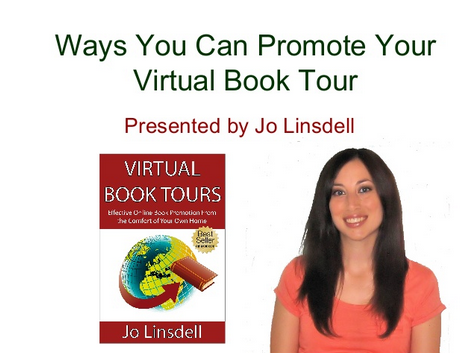 The benefits of doing a virtual book tour are numerous. They do however need to be done correctly in order to see good results. For your tour to be successful it's important that you work with your hosts to promote each of your tour stops in order to reach as many people as possible. As with any other kind of marketing campaign, you need to put together a plan and create a schedule for each activity. These are just a few ideas to get you started but, as you can see from this list, the goal is to let as many people as possible know about your tour. By reaching out in different ways and giving them a variety of options for how to follow your tour you increase your chances of them getting involved. If you have some ideas of your own about ways to promote a virtual book tour I'd love to hear from you so please leave a comment below so we can discuss them further.